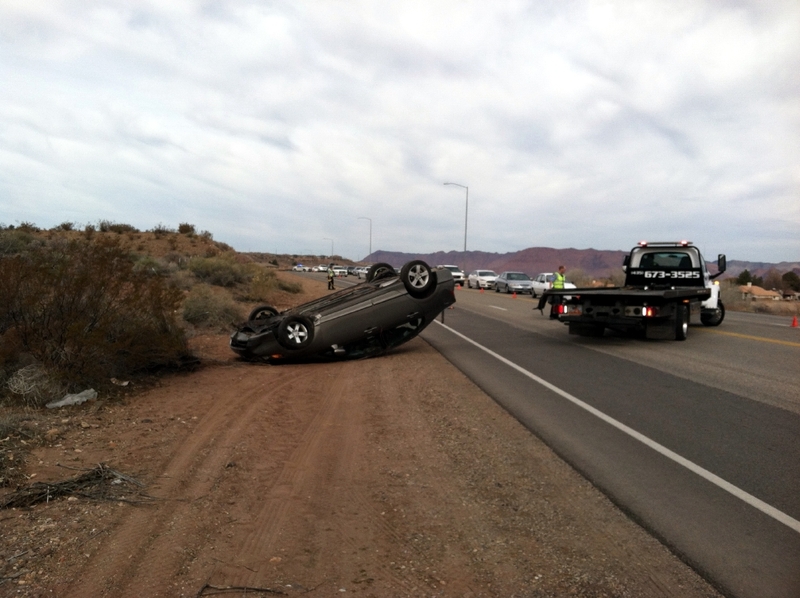 ST. GEORGE — An elderly man was driving southbound on Dixie Drive Saturday when a medical issue caused him to crash his vehicle. “As the road curved, he didn’t and he drove off the west side, hit a rock and rolled over,” said Sgt. Jeff Bahlmann of the St. George Police Department. First responders found the man unconscious at the scene. He was transported by ambulance to Dixie Regional Medical Center. His condition has since improved, and he was able to recount what happened to police. It is unclear why he lost control of the car, Bahlmann said. He was the only occupant, and no other vehicles were involved. Ed. CORRECTION: St. George News photographed this scene just after 10 a.m., the time of the accident was not specified by authorities, therefore the time of the accident as “around 10 a.m.” has been removed from the report as it may be in error. Not crazy about the new design, but….OK. The picture embedded in the story looks fine on a Mac, but is upside down on an iPad. The top picture is fine on both devices. Hope your geeks can sort that one out. I think you need to sort out your new left menu and your top menu. They both contain some items, but others are only in one or the other. That is a design that is confusing to the poor user, and to the best users too. I agree with Lester wholeheartedly. I liked the simplicity of the old design on my android. Too much stuff going on around everything now. But I will still be visiting this site only because I like the promptness of stories being posted…….I do like the captcha code being gone though. New format works well on Surface Pro running IE10. 10 a.m.?! I heard the sirens about a quarter to 8 and drove past that accident five minutes after 8! St. George News is way off on the time of this accident. I would say it happened at approximately 7:40 a.m.
We stand corrected, it seems, Mean Momma. Thankful that the elderly driver is going to be alright! I wasn’t going to help hijack the thread, but…I agree with Bub. Often, sports stories tend to bump recent “regular” stories to another page, especially around Thursday and Friday. That having been said, I enjoy this site and check it every afternoon! Ya really, I wouldn’t care if I ever saw another sports article again, but i get it. Also good point DB it does force the real new articles off the page in favor of the junk/fluff athletics articles. Hey Bub, DB, we made some changes this morning. Sports are now only in the sports section, brilliant concept! Let us know how you find it now. You have the worst editors! The car in both photos look the same but cannot be the same accident as they are not in the same location. Someone seriously missed the boat on this one. Unfortunately it happens all the time with The Spectrum. The car was in the bushes and then the tow truck pulled it out of the bushes – you can see the tow truck there. Mr. Thayn was there and shot photos of both. A caption to that effect will clarify, I’ll add it. To Joyce: Your reporter Natalie referred to the drive as “elderly”? Really? She considers Age 60 as “elderly”. Wonder what word she would use for an 80 year old? Fair point, Native. Perhaps the officer she interviewed used the term as Natalie did not include his age. I suppose it’s relative. P.S. Do you remember that 50 milestone when an AARP card arrived in your mailbox? Age 60 is the new 40. Seen Christy Brinkley lately? 60 is not “elderly” any more.